The Asia-Pacific is arguably the most important, but also the most complex and contested, region on the planet. Containing three of the world’s largest economies and some of its most important strategic relationships, the region’s capacity of regional elites to promote continuing economic development whilst simultaneously maintaining peace and stability will be one of the defining challenges of the twenty-first century international order. Intuitively, we might expect regional institutions to play a major role in achieving this. Yet one of the most widely noted characteristics of the Asia-Pacific region has been its relatively modest levels of institutional development thus far. However, things are changing: as individual economies in the Asia-Pacific become more deeply integrated, there is a growing interest in developing and adding to the institutions that already exist. 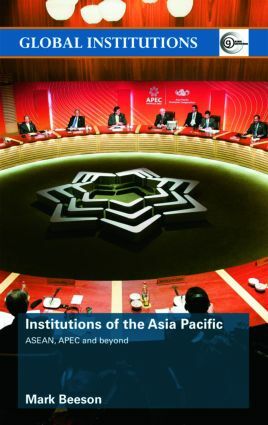 Institutions of the Asia-Pacific examines how this region is developing, and what role established organisations like APEC and new bodies like ASEAN Plus Three are playing in this process. An expert in the field, Mark Beeson introduces the contested nature of the very region itself – should it be the ‘Asia-Pacific’ or ‘East Asia’ to which we pay most attention and expect to see most institutional development. By placing these developments in historical context, he reveals why the very definition of the region remains unsettled and why the political, economic and strategic relations of this remarkably diverse region remain fraught and difficult to manage. ASEAN: The Asian way of institutionalization? APEC: Bigger, but no better?